How long will the fabric last? Acrylic fabrics are the top choice among all manufactures world wide. It provides years of protection against fading,rot and mildew.A high quality fabric manufacture that The Awning Warehouse uses will have a 10 year warranty. You should expect your fabric to last ten years or longer with proper care. Care instruction can be found in the care section of this web site. How long does a Retractable awning last? The rugged heavy duty frame work can last beyond 15years. As long as the owner takes care of the unit and having basic common sense,the awning will provide years of trouble fee,reliable service. How will the awning be attached to the home? There are a couple of ways to attach the unit to the home. Wall, soffit and roof mount. The most common being the wall. Professional installers will determine the right installation for you particular home of store. How far out can a retractable go? Retractable awnings can project as little as 5 feet all the way to 13 feet. Most common size is 10 to 12 feet. Is there a minimum height to install a awning? 8 feet is the minimum, anything less than that will require the unit to be roof mounted. roof mounted awnings are very common on a ranch style home. The roof mount brackets does NOT create any water trap and safely allows water and snow to pass. The brackets are aluminum and powder coated the same color as the frame and for protection and beauty. Why buy a retractable awning? 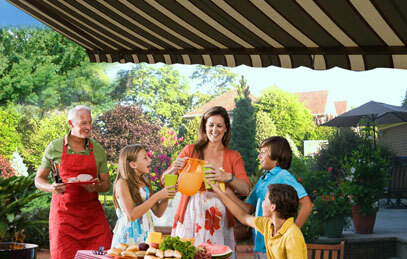 Retractable awnings provide years of protection from the harmful rays of the sun. Its great for entertaining as it allows your guests to relax and feel comfortable. Adds value to you home and stores away when not in use. However once you have purchased and use your retractable awning,you will wonder how you ever lived without one! Can I use my retractable awning in the rain? The Awninrg Warehouse’s retractable awnings are primarily used for the sun and should be retracted in heavy rains to prevent “pooling”of water on the fabric which will cause permanent stretching. However the awning can be used in a light drizzle or misty rain when strong winds are not present. Are there any winter preparations? Yes, its recommended that the front valance be removed but not mandatory. Simply remove the two screws,remove the valance and put back end caps. Store valance in cool,dry area. Should I buy a motorized or manual awning? It is generally suggested to motorize if the awning is 16 feet or greater or if there are any physical limitations. Manual operated are suggested for 12 feet and under but its a personal choice. Whatever you choose you can be sure that The Awning Warehouse operating mechanisms will provide years of trouble free use. Do I need an electrician to connect my awning? You can and is recommended that you use a license electrician. However its not necessary as more and more customers are choosing to utilize our “plug in ” system and using a hand held remote. This warranty covers the fabric becoming unserviceable because of loss of color or strength from normal exposure conditions, including sunlight, mildew, rot and atmospheric chemicals. It does not cover labor and installation supplied by the dealer. The warranty runs for 10 years from the date of original installation. What Will Glen Raven Do? Glen Raven will supply new fabric free to replace the fabric which becomes unserviceable. Labor is not included and may vary. Call us to inspect the installation or call another Sunbrella® dealer listed in the Yellow Pages under “Awnings and Canopies” or “Boat Tops and Covers”. The dealer will contact Glen Raven and secure replacement fabric for you. For more stubborn cases: Soak the fabric for approximately twenty minutes in a solution of no more than 1/2 cup (4 oz.) of a non-chlorine bleach and 1/4 cup (2 oz.) natural soap per galon of water at approximately 100° F. Rinse thoroughly in cold water to remove all of the soap. Note: Excessive soaking in non-chlorine bleach can deteriorate sewing threads, this method of cleaning may remove part of the water repellency and the fabric should receive an application of an air-curing fluorocarbon water repellent treatment, such as 303 HiTech Fabric Guard, if water repellency is a factor. Sunbrella® is made from 100% solution dyed acrylic fiber which is thermoplastic, do not subject to excessive heat. When Sunbrella fabric is stored, it should be cleaned, allowed to air dry, and stored in a dry, well ventilated area.